Over the course of the academic year, our Research and Instruction Librarians provided direct support for 150 unique courses and hundreds of student research projects. Of particular note this semester was the collaboration between Professor of History Patrick Rael and Marieke Van Der Steenhoven, Special Collections Education and Outreach Librarian. History in the Archives, a new capstone seminar in the History Department, developed and taught by Professor Rael in close collaboration with Van Der Steenhoven, allowed upper level students to experience the excitement and challenges of conducting original historical research through a deep dive into Bowdoin’s remarkable archives and manuscript collections. Through group discussions, hands-on activities, practicums, guest lecturers, readings, and other pedagogical approaches, the seminar’s ten students were introduced to the fundamentals of archival research, and in the process, how to form solid research questions, recognize leads, and then follow them out across collections. Each then chose an area of research well represented in Bowdoin’s vast holdings with the objective of writing a 25- to 30-page paper on topics including slavery, the Civil War, missionary encounters with Native American communities, the Cuban Revolution, the Medical School of Maine, and the 1970 student strike at Bowdoin. History in the Archives was one of over 52 courses from 20 areas of study that engaged with Special Collections & Archives this year. From one-off visits to weekly meetings, students interacted with a variety of primary sources, and many faculty developed specific research assignments around SC&A holdings. 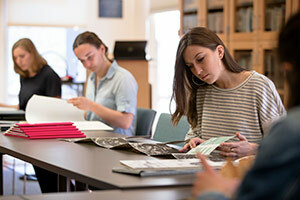 In April, the SC&A reading room saw 143 student researchers working on projects that ranged from selecting historic photographic material for a pop-up exhibit to using the College records to explore issues in gender and sexuality to inspire zines. Faculty interactions with staff in Special Collections & Archives represents but one category of faculty-librarian collaborations in support of student learning. This year Research and Instruction Librarians shared their subject expertise in courses ranging from First Year Seminars and introductory classes to capstone seminars that represent virtually all of Bowdoin’s academic departments and programs. Instruction was conducted in the classroom, individually, and in small groups in our new Research Lab on a wide variety of subjects including historical game simulations, food and fashion in China, nuclear proliferation, border education, documentary films, genomes, and the American presidency. One area of particular interest—one that crosses disciplinary boundaries—is the increasing focus on integrating data into research assignments. During this semester alone, faculty in Digital and Computational Studies, Computer Science, Mathematics, Environmental Studies, Economics, Government and Legal Studies, History, and Asian Studies, incorporated numeric or text data into their courses. The broad support the Library provides for data-focused courses is exemplified by the collaboration between Research and Instruction Librarian Barbara Levergood and Eileen Johnson, Lecturer in Environmental Studies, for students enrolled in Johnson’s The Nature of Data: Introduction to Environmental Analysis. In this class, the students were asked to collect and analyze data using one or more methods including text analysis, spatial analysis, or social network analysis in order to address an environmental social science research question. As the students embarked on their research projects, Levergood provided in-class instruction and an online guide tailored to the assignment. Students were asked to reflect on the importance of understanding the corpus of data available to them, crafting search queries with intention, the value of documentation, and the evaluation of methods employed by published studies. Research projects focused on a wide range of topics including a sentiment analysis on immigration and perceptions regarding gun control. For more information and to hear directly from faculty about the ways in which the library supports teaching and research, visit our Stories from Faculty page.